Bruce Wayne continues to agonize and plead that Mr. Freeze be found not guilty of the murder of three women to atone for his assumed misjudgement earlier. Wayne appeals to God, but this god is Batman himself and his faith in himself. Will Bruce Wayne succeed in convincing the jury members to release Mr. Freeze? Having waited all day for the Paul Manafort verdict from the jury and the plea bargain from Michael Cohen, this issue which was already excellent became more poignant upon a second reading. 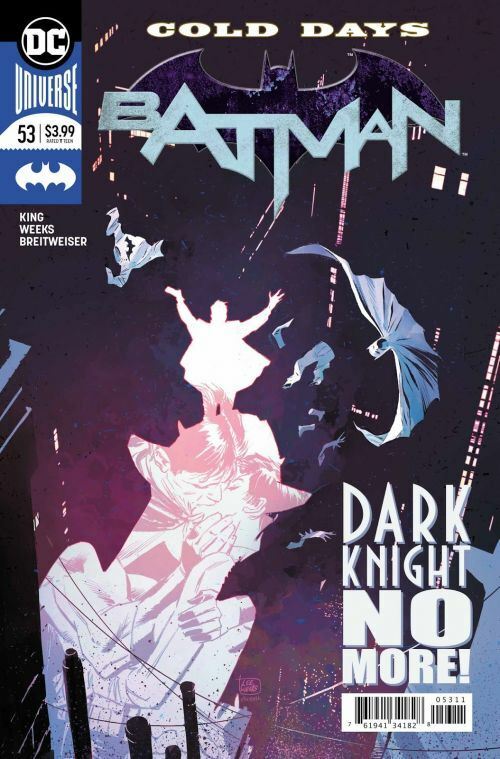 I disliked Batman #52 because I felt that it was overwritten and that Tom King in exposing Bruce Wayne’s inner thought, lost his focus on the prize. It is a fine line to maintain and in this issue, King gets it right. His faith soliloquy is clear and a pure representation of Batman to the world and Gotham City. It is weird how the same story can either be excellent or mildly so just through the words and staging used. Whereas King forced the nine-panel grid on Lee Weeks last issue, here he let the artist use the wide horizontal and vertical panels where the artist could expand and rely a bit less on talking heads. More visual exposition was used to augment the script. Weeks here was able to rely on strong symbolism to tell the story instead of sticking to pure drama and talking heads like the previous issue. This is of course more suitable to his strengths as a cartoonist. He uses a lot of symmetry in his layouts before exposing Batman in his original costume in the last page of the comic. It appears that King and Weeks have finally learned to work together in a complimentary manner.